The Joie Stages™ ISOFIX 0+/1/2 Car Seat brings you safe road travel for children aged zero to 7. The car seat and base which comes with it are reassuringly equipped. Plus, they meet the required criteria for car seat regulations (R129). They also meet ECE R44/04 certification. Joie Stages 0+/1/2 ISOFIX Car Seat can be used from birth to 18kg in the rearward-facing position. Then, from 9kg to 25kg you can switch it to forward-facing if you wish. For your child’s ultimate safety, the Joie Stages™ ISOFIX 0+/1/2 Car Seat has an energy absorbing steel reinforced shell. 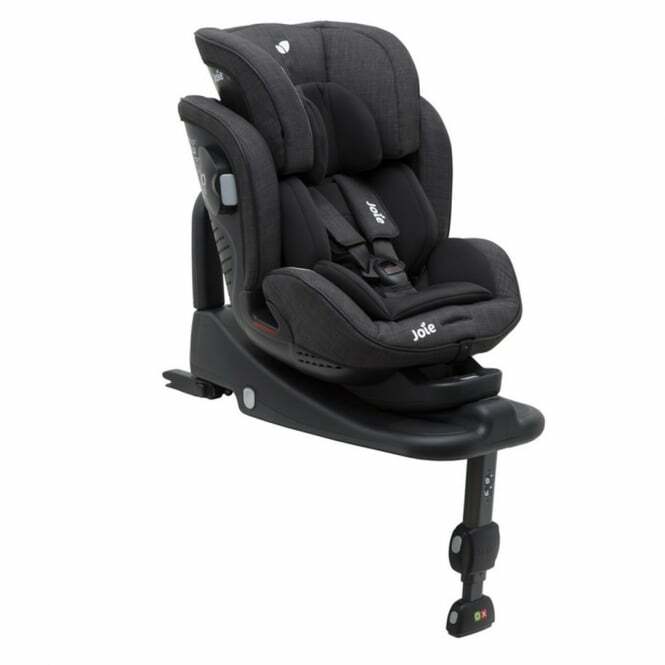 Who is the Joie Stages ISOFIX 0+/1/2 Car Seat suitable for? The Joie Stages ISOFIX Car Seat looks after your child whilst travelling while they are zero to 7 years old. It is such a great combination of both safety and comfort features - where do we start? There is all round seat ventilation to keep them nice and cool. They will also enjoy the adjustable leg support. This keeps their legs in a comfy position, and not dangling, while travelling. The exclusive Tri-Protect™ headrest contains 3 layers of security including patented Intelli-Fit™ foam. This headrest also has Guard Surround Safety™ side impact panels. These panels keep your little one safe in the event of a collision. As your children grow, you simply raise the headrest and the AutoAdjust™ side wings widen to accommodate their growing frame. The Grow Together™ 7-position headrest and harness system adjust at the same time. The great thing about this is that there's no fiddly re-threading of straps involved. Plus, the Grow-With-Me infant body and head support are customisable. The Joie Stages™ ISOFIX 0+/1/2 Car Seat has an easy to remove, washable seat pad. The 5-point harness with soft, padded covers keeps your bubba cosy and secure. You can easily tighten the harness in a one-pull motion. How do I install the Joie Stages ISOFIX 0+/1/2 Car Seat? You will find it very easy to secure the Joie Stages™ Car Seat onto the ISOFIX base which is included with the Car Seat. All it involves is just one click. Also, you can switch between rearward and forward facing by simply pressing a button. The retractable, 10-position ISOFIX car seat base which comes with the car seat fits safely into any vehicle built with ISOFIX attachments. The base allows the Car Seat to be positioned in 7 different reclining positions (including deep recline for the best of afternoon naps). There is no need to take the seat out and reinstall it each time. The ISOFIX base also has an anti-rebound bar. This bar is near your baby's feet. It is a great addition as it controls any rebound in the event of a collision. The bar fits against the car's seatback and stops the car seat from moving as much. You can only use the rebound bar when the car seat is in the rear-facing position. Once you have correctly installed the ISOFIX base, the clever colour indicators will confirm that you are now safe to go! Does the Joie Stages ISOFIX 0+/1/2 Car Seat come with a warranty? Where can I read a review of the Joie Stages ISOFIX 0+/1/2 Car Seats? What are the specifications of the Joie Stages ISOFIX 0+/1/2 Car Seat? The Joie Stages™ ISOFIX 0+/1/2 Car Seat weighs 14.27kg and measures 72cm (l) x 51cm (w) x 80.5cm (h) at its largest capacity. * Please note that you can only use the Joie Stages™ ISOFIX 0+/1/2 Car Seat with ISOFIX installation. The ISOFIX base is included in your purchase. Showing our 3 Joie Stages Isofix 0+/1/2 Car Seat reviews with an average rating of Excellent. Would you like to write a review? Your Review - Brought this seat for my 10 month old. Purchased because I liked the fact that it goes up until the age of 7. Seat was very easy to install! Which was a huge plus as I always struggled to fit the isofix base for our first stage car seat. I was concerned by the smoking of rock the seat had from side to side, but after an email to joie and taking into to two of my local baby car seat stores for the opinion I’m confident that it’s within the design. As baby gets bigger their weight will weigh it down and reduce the rock plus there needs to be slight room for movement encase you did have an impact accident the seat wouldn’t crack. It’s the forward and backwards rock that you would need to be concerned about! So over all i am now happy with my purchase! Your Review - Really happy with this seat, very easy to install, good recline on it which is hard to find with rear facing seats. My only slight niggle and it is only small, is that it could do with an extra slit where the button is to release the straps, it seems quite fiddly to get your finger in the hold where the strap exits to press the release button. Seat seems very comfy with a decent amount of padding and is easy to recline whilst child is seated.